At long last, The Professor and the Madman has a release date. This movie has had a long, troubled road. Not so much during production, but after filming was completed. It's been shelved for some time over various disputes which have finally been settled. That means audiences around the world will finally be able to see the compelling and violent tale behind the creation of the dictionary. 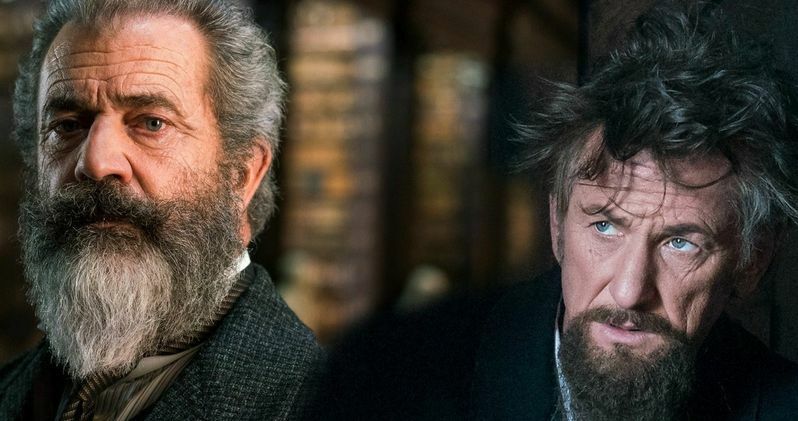 Yes, that's right, Mel Gibson and Sean Penn made a movie about the dictionary and as boring as that may sound, it appears to be anything but bland. Setting aside, for a moment, any feelings one may have about Gibson and his troubled past, this trailer hardly looks like it would be about a book that people used to look up the definitions of various words. Either somebody is good at cutting trailers together, or the story behind one of the most important texts in history is actually more interesting than many people may have realized. This movie was shot back in 2016 as Farhad Safinia's directorial debut. It's based on Simon Winchester best-selling novel, which was released in 1998, and has been in the works for years. Safrinia previously worked with Mel Gibson on Apocalypto. It was supposed to be released in 2017 but, in short, Gibson's production company Icon was allegedly supposed to have control over certain elements of the final product, including final cut. A lawsuit was filed and things got messy. Plus, there was a separate copyright lawsuit filed, which was recently thrown out. So the movie sat on a shelf collecting dust. Now, it's finally set to be released on May 10. The Professor and the Madman centers on the two men who created the Oxford English Dictionary. Professor James Murray (Mel Gibson) took on the challenge of creating the most comprehensive dictionary ever compiled, but faced a major challenge, as it would take him and his team over a century to compile all known definitions. Plus, language was advancing more quickly than their work. However, by enlisting definitions from people all across the world, the dictionary decades. As entries were collected, Professor Murray, discovered that one man, Dr. W.C. Minor (Sean Penn), had submitted more than ten thousand definitions on his own. Things become complicated when it was revealed that Dr. Minor, a veteran of the American Civil War, was a convicted murderer and being held at an insane asylum. The studio has opted to do a day-and-date release, meaning it will hit on-demand platforms and certain theaters on the same day. Critics have yet to weigh in, so there's no word yet on whether or not these legal troubles got in the way of this movie's potential quality. Luckily, we won't have to wait too much longer to find out. Be sure to check out the new trailer for The Professor and the Madman from the Vertical Entertainment US YouTube channel below.